With pet obesity on the rise in the UK, it’s important to make sure that your cat is getting enough exercise and physical activity – even more so for indoor cats that are not venturing outside. If this isn’t currently the case, it can have negative effects for your cat’s quality of life. A lack of exercise can impact on your cat’s mental health and general wellbeing, as well as being a big risk factor for obesity and other health conditions. Playing with your cat for just 20 minutes per day can help him or her to get more exercise, become more stimulated and strengthen your bond. 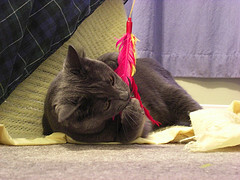 Many cats are quite reluctant to be active unless they are specifically encouraged, which makes exercise challenging. However, there are some ways that you can encourage your cat to become more active – even if he or she has not previously been very inclined to exercise. Trying to persuade your cat to exercise when they are really not in the mood is thankless and can potentially discourage your cat altogether. Most cats will have windows in which they are more receptive to playtime. This will often be in the morning or evening. Laser toys allow your cat to chase and attack a laser spot on the floor, which can be hugely stimulating and fun on a short term basis. The laser can be chased across the floor and even up a wall . However, there is potential for frustration too. With this game, your cat has no “real” toy to interact with and beat, and can quickly become bored. Following up with “real” toys can reduce this likelihood. Wand and fishing pole type toys can be great fun for your cat, especially for those who favour hunting and attacking games. Encourage your cat to run around after the toy to increase their activity and exertion levels but remember to let them win sometimes to avoid boredom and frustration. Instead of handing their food to them on a plate, introduce a foraging ball to make your cat work a bit harder for their meals. These are roughly the same size as a tennis ball and contain food. This will start to be released once your cat gets to grips with the ball and is a subtle way to encourage physical activity. Offer Unrestricted Access to Toys. Allow your cat to have access to their favourite toys in case they are in the mood for spontaneous solo playtime. Don’t leave the same toys out all the time though; they can quickly become uninteresting if they are always available. Instead, look to switch toys around on a regular basis to keep things fresh and fun. Cat towers with multiple platforms and levels can be useful for increasing your cat’s physical activity. It offers an ideal opportunity for your cat to climb and play, especially if you use treats to encourage this. If you don’t have a huge amount of space for your cat to play in, these towers make great use of vertical space. Do you have any additional tips for encouraging your cat to get more exercise? Let us know in the comments section below!